People use self storage as an extension of their personal and professional space. Nowadays, more and more people have its different reasons to use secure self storage. Some may want to have more room space for house or apartment. Others may need a place to store their items during the transition of their moving plan. Whatever reason it may be, the most important factor that we often concern when selecting a self storage facility is the security of our possessions. We don’t want our staff to be left unprotected and unsecured. Self storage has now become an alternative solution in keeping your stuff. If you wish to have more space at home but doesn’t want to throw things away, then self storage is perfect for you. 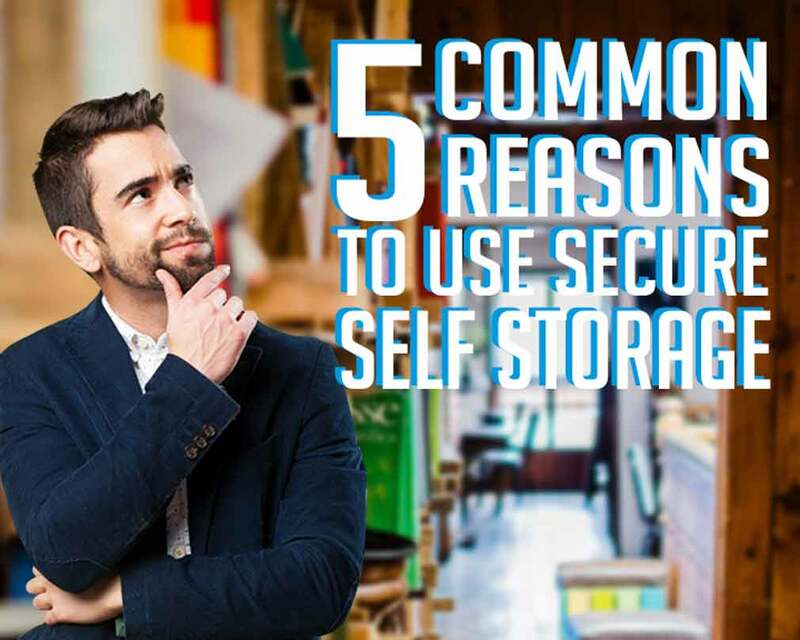 And for people who consider renting a self storage unit, here are the five-common reasons to use secure self storage. House owners have several reasons why they do house renovations. It’s either, they want to add room extension, reconstruct a leaky roof or repainting the house to have a new and fresh look. Whatever your reason for renovating is, one thing is for sure. Lots of adjustments will be made. We don’t want our pretty things to be coated with dust and paints while the renovation is on-going eh? In fact, self storage unit provides a safe temporary shelter for your valuable items as you do the renovation. Of course, we don’t just to store our goods for the sake of storing them. We also want them to be protected and safe while it’s away from us. Furthermore, once the renovation is complete, you can then have your belongings back anytime you want. Common reasons to use secure self storage unit is when you plan for house relocation. Yes, moving to a new place isn’t always a straightforward process that can be accomplished within the day. Delays may occur. And if you don’t have a backup plan, you could be left with a dilemma. When your belongings are ready to go but your new location is not available yet, where do you go eh? The common solution to this dilemma is to rent a short term storage unit where you can store your belonging until such time that you’re ready to go to your new house. Also, if you’re a business owner, you also need to plan for your office removals, in order to have a smooth transition as you transfer to your new location. Space constraint is also one of the common reasons to use secure self storage. Most people are hesitant to get rid of their belongings especially if it’s still in a good condition or it has a memorable value for them. The best option they do is to rent a self storage units Sydney that accommodates their belongings. Most people nowadays are starting their own home businesses. And often find out that their home offices are starting to lost more space. This gives them the reason to know how self storage can help them with this problem. Home-based businesses or even small companies are now starting to use business storage Sydney for their businesses. This helps them to operate normally in their own house with extra space. Common questions that give headaches to students during summer is that what they will do with their bunch of stuff as they leave for summer. Considering that most dormitories and apartments do not allow students to leave their stuff over the summer. It’s either they carry them home and bring it back as the summer is over or they could look for a place to store their stuff. Renting a secured self storage unit is the best option most university student does. In this way, they can avoid headaches and hassle as they take their summer break. It also gives them the assurance and security that their stuff is still intact as they return from their summer break. Self-storage unit can give a lot more than just a sense of security. It is also an easy solution for those people looking for a place to store their items temporarily. Self-storage should never be a painless process nor expensive for you. Ask the expert and know get to know more reasons to use secure self storage. Experience a hassle-free and secure storage facility. Get it all with Macy’s! Still Looking for More Reasons to Use Secure Self Storage? Visit our blog section as we have more useful tips that may help you! Or even read our article Organise your Storage Unit for more insights. Especially on doing a better packing process. This entry was posted in Storage and tagged Macy's Mobile Self Storage, secure self storage, self storage, self storage units.